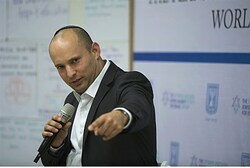 Economics Minister Naftali Bennett, who has been on a mission in the US over the past few weeks to prevent Sunday’s deal between Western powers and a nuclear Iran, has released a scathing response to the breaking news. “It is important that the world knows: Israel will not be committed to a deal that endangers its very existence,” Bennett concluded. Those comments come soon after the Jewish Home party head made similar statements in an interview with Army Radio, declaring that Israel is not bound by the deal.